Moldovan does do a lovely job–her voice floats, clear and true, through the vocal challenges faced by anyone playing Christine. 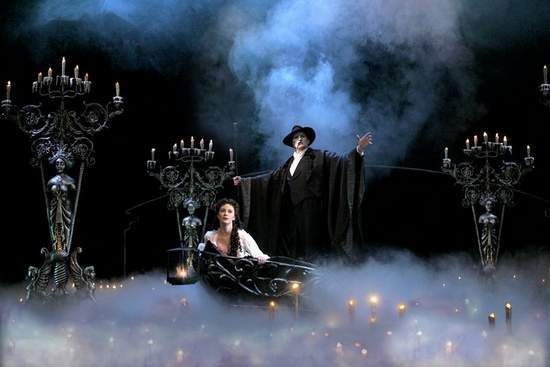 I was pleased that Gleason allowed himself to put his own imprint on the Phantom’s singing, rather than keeping every bit of phrasing and inflection like Crawford’s. I was also impressed by the actors playing Firmin, Andre and Madame Giry–they did very well. Yes, I agree — all of the supporting performers were good. This is a very strong cast overall. I take that last little bit as an insult! SOME amateur groups will slaughter the show, but if the theatrical group puts a lot into the show (money, time effort) then I think the show will be amazing! I live in a small town where there is a fabulous community theater, and they’ve decided to wait until we have the money and the capability to make Phantom an amazing experience for those who can’t fly to Broadway for a weekend!